The third Marquess of Lansdowne was no stranger to the rich and famous that came to the great London house. His father had hosted Benjamin Franklin (1706 – 1790) when the latter came to negotiate the terms for American independence. One who was credited with the discovery of oxygen, Joseph Priestley (1733 – 1804) ran tame at Lansdowne House as well, living off the largess of the first marquess when he was still Lord Shelburne. The greatest scientist of the Regency was no stranger to Lansdowne House. 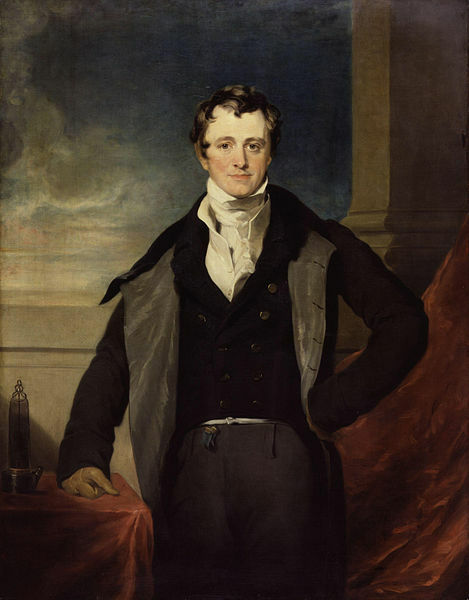 Sir Humphry Davy (1778 – 1829) was a pioneer in chemistry, having discovered important earth elements and inventing the Davy lamp used by miners to detect dangerous gases. But enough of the science. I declare, the stuff makes me bilious. Truth to tell, Sir Davy put on exhibitions of his experiments that were not only explosive but made all the females swoon. He was a very good public speaker, endowed with considerable charisma and the elusive ability to impart science in an understandable manner. Note the cartoon and its display of Davy’s large female following. I cannot deny he is rather attractive. Is it the neckcloth or is it just me? Spectators were particularly drawn to his experiments depicting the effects of nitrous oxide. He once said that laughing gas bestows all the benefits of alcohol and none of its flaws. This entry was posted in Regency, Uncategorized and tagged Lord Lansdowne, nitrous oxide, Sir Davy Humphry by Angelyn. Bookmark the permalink. Another top notch, detail rich post! I never leave your blog without learning something new. Excellent post, Angelyn! I’m really enjoying your Lansdowne articles. I had no idea laughing gas was around during this time. Apparently Sir Davy enjoyed experimenting with nitrous oxide but had the misfortune of not understanding its potential as anesthesia. Laughing gas was treated as an oddity at the time. It would be decades before it was employed in a medical setting. Very nice. I agree, he is good looking. But then Regency clothes on a man just do it for me. Yes–they most certainly do! The Belcher neckcloth, particularly. I wish I had had a science teacher like him. Thanks for another fun, informative post! Lovely post! It is amazing the inventions, which occured much earlier than I thought. I just recently learned that Ben Franklin is credited with creating the first catheter. Oh the things you learn from Regency posts. Thanks! I’m glad you are learning from mine! Thanks for stopping by!